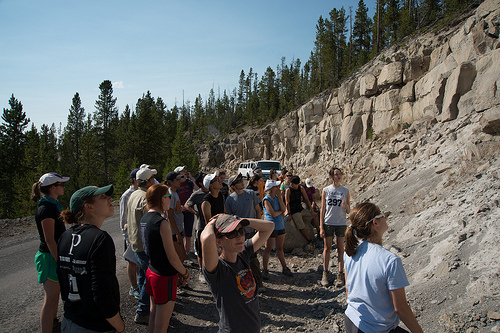 From August 17th to 23rd seventeen freshmen, five undergraduates who had been on previous trips, and eight graduate students, staff and faculty spent a week in Yellowstone Park exploring, hiking, and learning. The purpose of the trip is to teach students basic earth science from the nature and causes of volcanic eruptions to the origin and diversity of microbial life in hot springs, to what we can tell about past climates from the fossil record. Upon arrival in Bozeman Montana after an early morning departure from Boston, students were loaded into vans for the drive to Yellowstone National Park. We set up camp at the Bridge Bay Campground on the west side of Yellowstone Lake and settled in. Each morning there was a brief lecture on the main topics for the day and every evening a small group would present a slide show projected onto a sheet on the side of a van that would review the day’s activities often with embedded skits to drive home a point and garner laughs. The Yellowstone caldera last erupted about 630 thousand years ago and the depression created by the eruption has been filled with thick rhyolite lava flows. There is still magma beneath Yellowstone at depths less than 10km and one manifestation of it are the abundant hot springs and geyser fields. We examined the products of volcanic eruptions from rhyolite domes to ash-flow tuffs as well as geysers and the silica rich deposits that accumulate around them. The Yellowstone area is closely monitored as there is a high probability of another eruption—when is the crucial question. 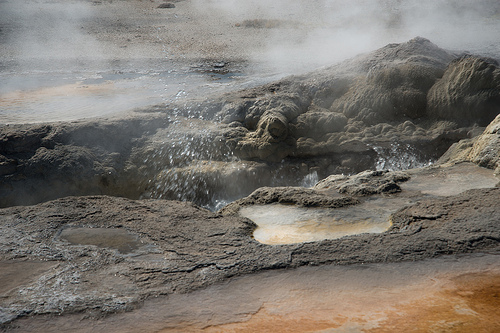 In addition the hot springs are full of microbial life that have adapted to high temperatures and low pH. We examined the hot springs to see how the communities change as a function of decreasing temperature. On a day trip to Jackson Hole we took the tram to the crest of the Tetons to explore the geology. The Tetons are the result of uplift along a large fault over the past 15 million years and earthquakes have occurred along the fault in the recent past. Standing atop the Tetons allows one to see the results of the interactions between continental glaciation, volcanic eruptions, tectonic uplift of the Tetons, and erosion. We hiked to a glacial cirque and discussed glaciers as agents of both erosion and deposition with the cirque carved by the glacier and enormous moraines deposited as the ice melted. Another day we drove into the beautiful Lamar River Valley and hiked up Specimen Ridge. The valley and lower elevations of Specimen Ridge are littered with exotic granite boulders, derived from the north and dropped by the melting ice. On Specimen Ridge a series of fossil forests are preserved-each buried by volcanic mudflows. Remarkably, many trees were buried in growth positions with their root balls intact. Counting tree rings of oldest trees suggests each forest existed for about 500 years before burial and the exquisite preservation of plant material allows a climate reconstruction for the region 50 million years ago that is much like the present day southeastern US. 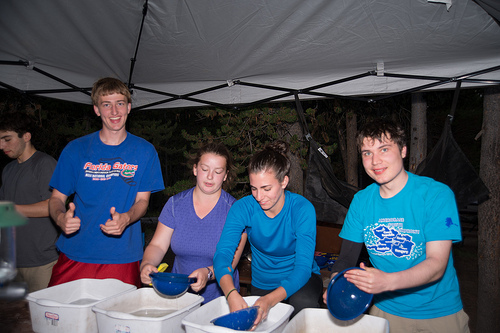 An important part of the experience is managing the daily life in camp; from waking up on time, to preparing meals and washing dishes for 30, to working on the daily presentation. The wildlife in Yellowstone is an important part of the trip. In addition to the mule deer in our campsite and bison on the road we had sightings of elk, coyote, black bear, and moose. A selection of photos showing everything from geology to camp life can be found on the EAPS Flickr photostream at http://www.flickr.com/photos/eapsmit/sets/72157635333015926/. All photos credit Vicki McKenna.